Seven Annoying Things People Say to Pianists – The Bookshelf of Emily J. Uh, no. I don’t learn difficult music over night, unless I spend the entire night practicing. I also only perform when I know I can do my best, which requires practice and time for the music to sink in. Last-minute performances are not my strong suit, although I do know some musicians who can pull this off, like professional ones. I am not one of them. No. They aren’t the same at all. The keyboard is missing most of the octaves, which my pieces require, and the touch of a keyboard is plastic and unresponsive, unless it is one of those weighted keyboards with the pedals. Still, it isn’t the same! First of all, piano pieces are called “pieces” not “songs.” Secondly, just because a piece has dissonance does not mean that the person playing it is crazy or unbalanced. Try taking a music appreciation course and learning more about the periods of classical music, including the contemporary one. Good luck with that. See my response to number 1. Well, it depends. If I’m practicing, then I play loudly to work on muscle memory. If I’m performing, it is likely that the music is marked forte or fortissimo, so therefore, as a good pianist who knows how to follow dynamics markings, I would play loudly. I also play loudly because I’m confident and comfortable in expressing emotions through music. So these are my pet peeves when it comes to comments about piano playing. Are you a musician? Do you have any pet peeves or strange stories about how people comment on your instrument? Do you have pet peeves about how people perceive something else that you are good at, like a profession? Perhaps there is some natural affinity! #5 is hilarious, and appropriate this week. Yesterday marked the 100th anniversary of the debut of Stravinsky’s ballet “The Rite of Spring.” It’s a revolutionary avant-garde piece full of dissonance, key changes, strange instrumentation and unmelodic sounds. There was a virtual riot in the theater and Stravinsky had to sneak out the back! New forms of music have always caused people to have visceral, even violent reactions. Ha! I guess that proves how powerful music really is. I’ve always loved “strange” music, especially when I get to play it. Much more fun. LOL! I guess I need to start surrounding myself with people who understand! Wonderful post, Emily! After a lifetime of wanting to learn to play piano, I started lessons about two years ago, and it isn’t easy. You’re right about the practice involved and it takes a lot of work, even for someone who has talent, which i’m not sure I do. I get similar comments to those you listed, except in re: writing. And it is annoying. Most of the time, it seems just better NOT to enter a discussion. Your post made me smile as I could hear your “voice” loud and clear. Ah, my snarky inner voice. I try to hide it! I can see people saying things about writing. I guess we all tend to criticize or just make mistakes about things we do not understand. every artistic skill comes with annoying questions. Though I admit I’ve accidentally asked a few of these in the past, I’ll be more mindful from now on. I’m sure I’ve said my fair share of misinformed things to people whose talents I don’t understand. But you’re right. All skill has the potential to be misunderstood. Yes, I do. I was a human resources executive for years and enjoyed my profession. When some people learned I was in the HR field, they’d respond, “Oh, so basically you just hire and fire people, right?” Or, “Oh, you guys plan the company picnic, right?” I didn’t bother explaining to those buffoons the work I performed problem-solving and developing and implementing strategies for companies to maximize the talent of individuals so that they (the individuals and the company) could self-actualize. Oh my goodness! The company picnic? I laughed a little. Sorry. I do feel your pain! Thank you for writing number four. There are few things I hate, but one is the keyboard. I can’t stand playing them, even the weighted ones. I hate the fake sound that comes from them or the fact that people can push the “drum” button and automatically assume they are percussionists (another group of instruments I played for eight years in addition to the now 16 I’ve been playing piano). I’ve had all of these questions asked to me, especially the seventh one, because I went through a period where I wanted to play LOUD pieces. I love LOUD! And as to the keyboard, we stayed in a lodge this weekend where there was a keyboard on the other side of our bedroom wall. All of the little kids staying in rooms around us kept pounding on it and starting up those beat sounds. So I sneaked out there and stole the cord, kept it for the rest of the trip, and returned it when we checked out! Problem solved. that’s sooooo funny. i am not surprised by any of those. in the church, especially, i think musical talent is valued but not appreciated. i only play at a “hymn level” and don’t tell anyone i can even play that because i fear being asked to play something harder and then making a fool of myself because sometimes i think i can wing it but i CANNOT wing it. I don’t play, but I love to listen and deeply appreciate good music. Thanks for the fun blog. I now know what not to ask pianists next time I run into one! Yes, just stick with compliments (for any musician) and you’ll be fine! We’d bought a piano this weekend, an emotionally monumental purchase for me, because my parents couldn’t afford one as I was growing up. Somehow that led to us convincing ourselves that we just didn’t have it in us to be good in music. And so I am very guilty of #1 and #2 on your list…the messages we get growing up can be so powerful. When I tell fellow musical friends that I didn’t believe I had talent, it wasn’t a cop out, but an actual, deep seated belief that I am only now beginning to change. I had almost begun to instill it in my own child but am grateful I caught myself before it was too late. It’s heartening to know that you became talented through hard work! What a beautiful comment! It is an emotional thing to be able to give your child the gift of music. That is really cool. Stick with encouraging him to practice. There is a time for every child when they want to quit, because it is hard. Once they get over some of that and reading music starts to click, then it gets easier and more fun. I’ll check out your post! Thanks, Emily! And I appreciate these words of wisdom. I am a complete music newbie, and I’ll need to know how and when to push my kid when things get hard! Yeah, no way! I’m not good at transposing at all. I think some people have a talent for listening. There are those who can hear what I can’t hear in music, even though I can play. I say sit back and soak in the music – just enjoy it:) Great Post – thanks for sharing! Music is definitely meant to be enjoyed! That ability to convey emotion through music is the MOST important. That’s what it is about! I was always better at technique, though. My sister was good at the emotional playing. You just can’t win! I understand your feelings of not wanting to be singled out. I was a very shy child, and I think all of the forced performing was ultimately good for me, but I did shrink away from it when I could. Thank you Emily for bringing me back to my roots. I even started a new section in my YouTube just for piano pieces! haha When I was a child and my very old Polish Maestro would have me learn something “odd,” it really used to bug me. He and I had a really hard time communicating – guess that was the problem (I was 5 when I started with him). My feet didn’t touch the floor and octaves and playing loud were very difficult! (little hands). And when I finally went to University of Texas at Austin, having perfect pitch was a curse especially in sight-singing. I learned how to transpose with a fury! (the tape machine the prof used was never in the key he said it was!) And my most hated comment? “Can you play this, or that…” whatever, I hated impromptu requests… especially from adults… At UT, the whole music school was about name-dropping and “mistakes.” The last concert I went to was in the huge and beautiful red velvet LBJ Library Concert Hall, to see the UT Jazz Ensemble play. My young husband was playing bass guitar at that time, and he was so scared I could see it written all over his face. And as I looked around the group at the other musicians, they too had the “look of sheer terror” and the music reflected it. After that quite “sorry” performance, I decided that if music wasn’t to be enjoyed, then music school was not for me. That, and the fact that the Conductor of the Austin Symphony at the time was also my French Horn instructor, and he never stopped yelling at me from the time I sat down beside him, until the time I left the room, and I think the farthest we made it was perhaps two lines of music, and that would be after he became totally infuriated, I guess. I was in the State and Regional Bands, and won some awards on the Horn, but I guess this man’s idea of teaching just did not mesh with mine. So when I explained to him that when he yelled, it caused my throat to close up, I think that was the final nail in the coffin of my music career. It is very sad, because if I had had some encouragement and a little support, I believe that I was one of those kids that had real talent and ability, but it became squashed in stress and performance anxiety. But by reading your post here, I am once again inspired to buy a new piano, a “REAL” one! haha It will take some time, no doubt, but when it gets delivered, I will be in heaven again, I am sure. Thank you again for bringing me out of the dark, and back into the light that is music. 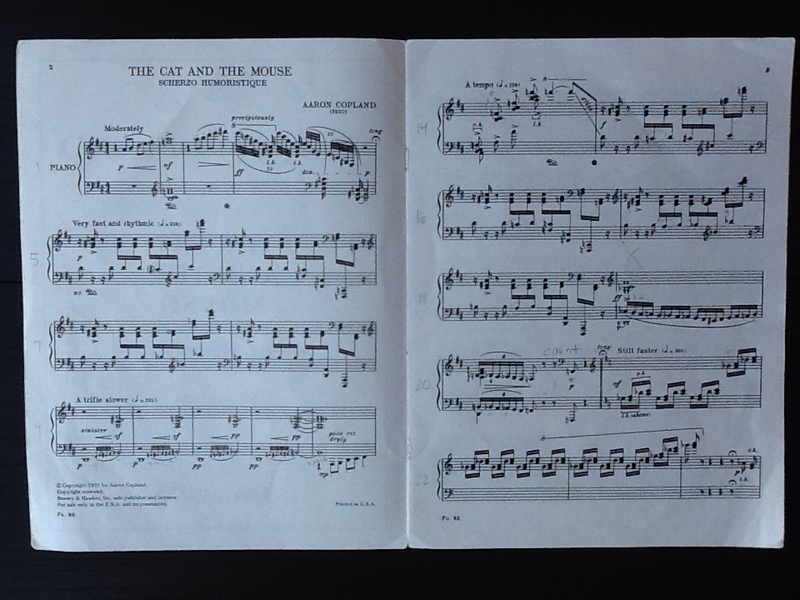 I listened to the piece “Cat and Mouse” and found it lovely! I guess when we get older, our imagination has had a chance to develop! Thanks for sharing. That is a really neat story. Was it Edison who said that invention is 99% perspiration and 1% inspiration? I think that’s true for a lot of things. Love your comment and your memories! It sounds like you’ve had many great (and terrifying) musical experiences. You reminded me of when I started to lose confidence in my memorizing abilities when it came to piano. I was a senior in high school and I kept losing my spot in Haydn’s “The Harmonious Blacksmith, Air with Variations.” I had a competition coming up, and I just knew that I would have the memory slip when I performed. I practiced and practiced, but sure enough, I totally lost my place while performing and had to start over. It was a humiliating moment because it had never happened to me before. I have never ever since then played without my music in front of me! I hope you get that piano and start practicing and loving it again! Thank you, BTG. Way to be the fan! Every musician needs that. Emily says it so well….. I reblogged this post too. I love it! The musician’s pet peeves, in a nutshell. I feel very lucky and privileged to be able to play, and I try to practice as much as possible. I’m hoping that my daughter understands how lucky she is to be having lessons also, but right now she views it at work. Well, it is work, but it’s good work, absorbing and inspiring. It feels like a kind of magic, to be able to sit down and produce music with just one’s fingers. Yes, privilege and magic for sure! I was moved by Cecilia’s comment and her post. She really brought it home for me just how blessed I am to have learned to play. I’m glad I succeeded at being funny. It IS shocking! I can totally see this applying to knitting! I came through this via Lea Ault. Great post, very funny! how well i remember my mother’s gift for music; on quiet days when that big old house seemed to almost swallow me, i’d find my mother and shyly ask, ‘will you play the piano for me?’ i would sit on the bench and bask in awe, of the music, of her pomp and circumstance as she lost herself in the music. i had abandoned my own attempts after three years of lessons.. i truly tried, but the gift didn’t seem to be mine. i could follow those notes, but it was the spaces between those notes that fell short. alas, i am glad that i stuck with art, and that i can appreciate those who stuck with their piano. 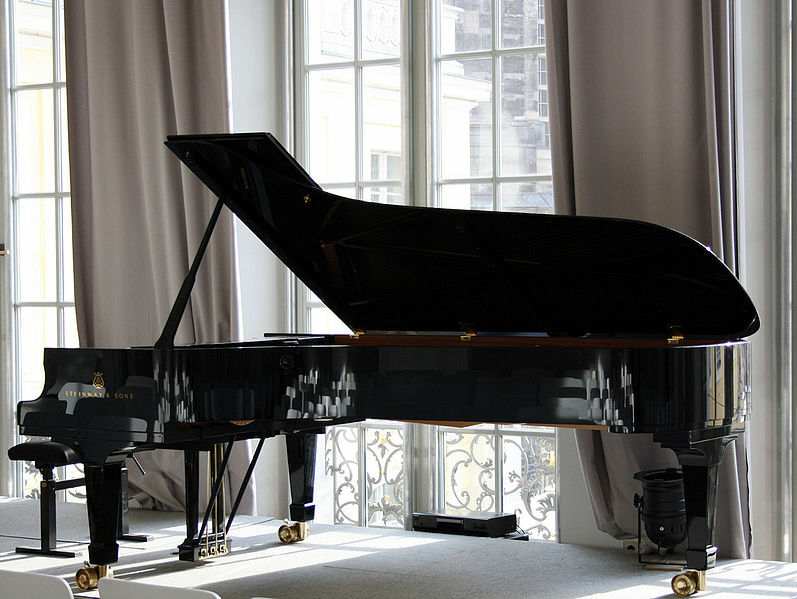 piano is usually my preferred background..Ludovico Einaudi’s “Fly” and my favorite right now is Viva by Dirk Maassen. so many of the pointers in your post also apply to art! thanks, for a great post! That’s beautiful! I can see why it inspires you. Yes, these ideas certainly apply to art and other situations. I agree that you should charge. But there’s something nice about giving, too. yes, giving is very rewarding, especially if it’s from the heart.. i have found that many people are also users, and they’ll consume my time, energies, forever asking, ‘could you paint a little poster for our cause?’ or “could you judge this contest,” yet there doesn’t seem to be a balance after a while.. they only come around when they want something and don’t seem to support my own causes/show/exhibits. I like the idea of balance! A wise shaman! I like that because I often feel guilty for getting frustrated when I don’t get something in return after giving and giving and giving. It can be exhausting to be used. But the reward for giving or volunteering is usually great, like you said in smiles and hugs and friendship, so it is worth it! yes, we can only ‘give away’ so much of our time, otherwise others would spend it all for us.. we have to follow our destiny, and not what others want for us! I’m happy these are recognizable and not just my own experiences! That’s so funny. It just goes to show how we all have mistaken ideas about that which isn’t familiar. I think it is also hard to recognize complexity in those things. I know! I had students do that too. There are many problems with those piano versions of popular songs, but what bothered me most was the simplification and therefore loss of correct rhythm! They are terrible. And learning classical music is always better and the foundation for successful playing later in life! Yes! I agree with all of these. I played piano all throughout primary and high school (only a couple of years ago) and people would also say “oh so if I gave you a piece, could you play it now?” Um, no. Just like if you gave Daniel Day-Lewis a script, he wouldn’t read through it once and have it memorised perfectly. Also couldn’t agree more with your keyboard dislike. I gave up because I moved into an apartment, and I just couldn’t bring myself to replacing my lovely old piano for a (more practical) keyboard. What a great comparison to acting. We all need practice, even when we play well or act well, or whatever it is! Smart response. I’m going to use that! What an informative post. I know nothing about music. Now I know that the proper term is ‘piece’. I’ve always meant to take a music appreciation course–thanks for reminding me that I should look into that. Oh, please do! Music is such an integral part of all of our lives, and taking a course like that will only enrich your listening experiences. Thanks for the comment! In my years as a pianist, I have heard most of what you have written. Thanks for sharing your thoughts. I’m glad to know I covered it well! Thanks for commenting, Jim. Although not a musician I have some idea of how you feel. I’m multilingual and have lost count of the number of times people have asked me to translate or interpret something for them. I can give you the gist of what was written/said but translation and interpreting are skills – people study to take up those professions and practice them constantly. I just happen to speak some other languages. Yes, that is so true! Translating is another skill. My dad speaks many languages and can do some of that, but it is different than just speaking for sure. Thanks for sharing. This is great. I can relate to most of those points. I started learning piano a few years ago and love it, though I’m really a novice. Violin is my key instrument, but those same points apply. One of my pet peeves is when friends or family would ask why I spend so much time practicing. They seem to assume that since I know how to play that I shouldn’t need to practice, as if playing a musical instrument is like riding a bike, but really playing an instrument takes so much commitment and time, but it is one of the most rewarding things I can think of. Definitely not like riding a bike! Practice makes perfect, right? Or perfect practice makes perfect? I think the attitude of your friends and family goes along with the idea that if you play an instrument you can just sit down with any piece of music and start playing it perfectly. Good luck with the piano! You already know how to read music, so that’s half the battle. This is a fun blog. I am aware of the “You play the piano, then can you play X for me?” syndrome. There is no anti-dote. The piano (ok … upscale weighted keyboard) is an escape. With the headphones, it’s like selecting the music for my own mini concert. Thirty minutes later – peace! Yes, escape for sure! And there’s certainly peace. I’ll take peace whenever I can get it! #3 , #5 , #6 are the most common few dialogues I’ve encountered,now people are like they’ll learn for hardly a month and expect brilliance and expertise to overflow their performance,learning never stops,I’ve been doing this since 2nd grade and almost 12 years have gone,it never ceases,practise and learning never ceases. That’s so true. There is always room for improvement. Enjoyed reading the comments and strange things we deal with as musicians. My pet peeve is in pronouning “accompanist” and “pianist. I hear…”My accompneeust Is…” (instead of “a COM panist”) Also, “our PEEanist is…” (instead of “pi YAN ist”) I do not play the “PEE an-oh” …so listen to how you pronounce the word of the person who plays the piano for you. Ha! This is so true. Pronunciation is another funny, yet annoying, issue. Thanks for adding that one. Wow. This is so accurate! Haha. A while back, I was playing piano at a church that didn’t give us the sheets until the Sunday we were playing! For some strange reason the worship pastor couldn’t understand why I found the job so difficult. It ain’t easy, bro! Thanks for this post! Oh my! I would’ve had a conniption fit every single Sunday! A very entertaining piece:-) I am a nurse in intensive care & last year we switched to completely computerized charting. I found it easy to adapt to & became competent in it quickly. A senior colleague recently commented that she hated that I “was better at it” than her. People never cease to amaze me. Oh my! Maybe she should put some effort into it. I understand completely what you are saying here. My son is a percussionist and when he tells people that he gets, “So basically you beat on a drum!” – My answer would be, “Uh, no. There are many, many percussion instruments I play. Marimbas symbols, timpani, Xylophone. Timbales…… It isn’t just beating on a drum.” His answer? He just shakes his head and changes the subject! I like that you point out how it applies to other instruments. So true! I just love this post! As a pianist (though, just someone who has been playing for years, and getting lessons for years, not like a professional one) I can relate to these so much! I think my pet peeve, is when someone is like, oh can you play x? Or can you play y? Just because I can play piano, I don’t know every single song in existence, even if it is a well known one, doesn’t meant I’ve learnt it! Yes, exactly! I hate that too. #5 made me laugh! I started playing piano and having lessons age 7 and I continued practicing almost daily for 10 years. I fell out of the habit when I was busy preparing for college and I haven’t played for a while. I know I’ll need to practice a lot before I get to the standard that I was before. I do miss playing the piano though; I ordered some new sheet music today and I intend to start playing again. Do start again! You will be surprised at how fast it will all come back. I’m surprised at how pieces I played so long ago will come right back out if I sit down with the music for a few minutes. Pingback: Freshly Pressed Is the Kiss of Death | The Bookshelf of Emily J.
I agree that some of these are annoying, but I do actually have a pretty natural talent for piano. Only one year in and I’m already playing Rondo E Capriccio at over 280 BPM! (Though just the first part =(.) I still think I could get better though, because I can’t play La Campanella yet lol. La Campanella! That is HARD. Liszt had some of the largest hands and wrote his music accordingly. Good luck with lessons. It sounds like you are off to a good start. That would be so annoying! Of course you are the one who should get the credit! Pingback: Girls’ Studies: Oh, How I Miss the Mix Tape | The Bookshelf of Emily J.
Pingback: My Top Ten Classic Novels for Teenage Boys | The Bookshelf of Emily J.
Pingback: Soundtracks and Show Tunes | The Bookshelf of Emily J.
Haha that’s all so true. I don’t play very well but I accompany myself for singing a lot. I really hate when I am playing and people come in and stare at me.. Am I alone in hating being watched play??? It can be unsettling, especially if the person watching is right over your shoulder! I don’t feel that as much when performing for a large audience though. I know I’m late to the game here, but I just started following your blog and this post caught my eye. I’ve played for 14+ years, but my pet peeves have remained constant the entire time: 1). When people try to strike up a conversation while I am in the middle of a piece, 2). “Oh, you play piano!? Play something for me RIGHT NOW!” Well, I’m not gifted with the ability to play from memory, unless I slave for months to memorize (and even then, it’s gone the moment I stop working on it). I can sight-read the dickens out of just about anything but please don’t ask me to play when I don’t have my sheet music with me, or you’ll get a badly rendered “Fur Elise.” Loved the post! I love your thoughts! Yes, a bad version of Fur Elise is about all I have memorized these days. Great additions! You are spot on. Three, sometimes four, afternoons with the teacher. Practicing 2 hour days, five days a week over 10 years. After I learned the basics, I only played classical. I have heard the ‘Im teaching myself’ thing a few times. I dont want to be rude, but no, not going to happen. You will not be on the same skill level as I am, unless you put in the work. I just smile and nod, they will soon know that themselves, why argue? Quit my first teacher, I played to ‘loudly’. And she only wanted me to stick to a certain genre. My next teacher was amazing! She understood I was loud because I felt the music. Oh, my first teacher also got mad when I started to rock back and forth. Yea, she was NOT a good teacher. So true! That first teacher you had sounds like he or she didn’t know what they were doing at all! Oh my, I just happened to stumble across this, and it is so accurate! I’ve heard numbers 3 and 4 so many times, it drives me up walls. Great post! Ha! So true. I was listening to some other Billy Joel the other day, though, and the man is talented. What music!